Storify is shutting down soon. Which is a shame. There was a point where I, and others, were using is a lot. It was a nice way to compile lots of internet resources into a single coherent timeline. Online services — like Storify — may contribute to the lack of understanding that publishing is not free, regardless of whether the reader pays or not. They make stories, it costs them only a sign-up information, and they wonder why scientific publishing can’t be the same. People do not understand that services that are called “free” are only free to them, not free across the board. Someone is paying bills. Preprint servers get millions of dollars in support to keep them running. The closing of Storify shows one of the reasons “free” is not a good way to think about scientific publishing. “Free to read,” sure. But as much as I love me some free to user online services (like Blogger, which has powered my writing here for over a decade and a half), they’re not a good model for scholarly publication. I am playing with Wakelet as a replacement for Storify. Hat tip to Carl Zimmer for the news about Storify. What are you thinking, Switzerland? At the start of this week, I saw a news story about new Swiss regulations for the handling and killing of lobsters. (Coincidentally, it came very shortly after this very good article about similar issues around fishes.) This started with a motion by Green Party politician Maya Graf. She wanted to ban lobster imports into Switzerland outright, but Switzerland already had a trade agreement with the European Union that ruled that out. Lobster and other crayfish may no longer be transported on ice or in ice water. This is important for the import to Switzerland. All species living in water must always be kept in their natural environment - this also applies to the lobster. In addition, crayfish must be stunned before being killed. The usual dipping in the gastronomy not stunned lobster in boiling water is therefore no longer permitted. Further information: Articles 23 (1), 178 and 178a of the Animal Welfare Ordinance . New scientific evidence shows that crayfish are just like vertebrates, sentient and capable of suffering. But it does not summarize what scientific evidence was examined and used to justify this decision. However, the Swiss website links to a document from the Australian Royal Society for the Prevention of Cruelty to Animals (RSPCA), which implies they agency agrees with the material contained within. The RSPCA document does have a reference list of research papers, with the most recent references dating to 2015. The RSPCA document is not intended to be a scientific literature review. But that it does cite scientific papers can give an impression of greater certainty and consensus in the scientific community than is perhaps warranted. For context, and in the interests of full disclosure, there are very few research groups have published empirical behavioural data about crustacean noceiception. One is led by Roger Elwood, and another is led by me. There are a few other papers from other places. First, two research labs is a small fraction of the crustacean research community. Even if those two labs were entirely in agreement about the data (the two labs have contradictory results on one effect) and the interpretation of those data, two labs should not be taken to represent a broad scientific consensus. 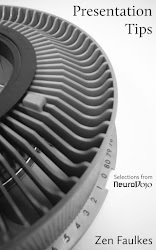 A 2014 book on crustacean nervous systems and behaviour alone has somewhere around 30 authors, none of which are from the two labs I mentioned. Third, not all researchers examining the data are in agreement, even those with expertise in the relevant issues. In her book Can Fish Feel Pain? (reviewed here), Victoria Brathwaite describes having long conversations with Elwood about this topic. 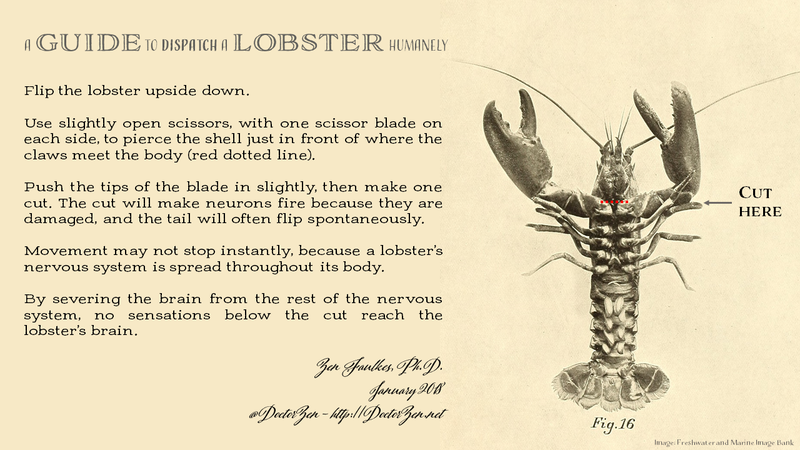 Despite Elwood’s arguments, Braithwaite concluded that lobsters do not feel pain. Joe Ayers (who was an examiner on my Ph.D.) also disagrees. Fourth, the papers cited by the RSPCA do not claim that lobsters (and other large decapod crustaceans) are sentient, nor do they claim that they suffer. The papers are appropriately cautiously worded, and say the results are consistent with crustacean pain. Elwood has said this when speaking to scientists. “Consistent with” means “not ruled out.” It doesn’t necessarily mean likely. But when speaking to the general press, Elwood has said lobsters probably feel pain. As quoted above, the Swiss Q and A goes even further and says lobster pain has been shown. And thus do we move from “possible” in data, to “probable” in the public eye, to “definite” in law. The specifics of the policies are also puzzling. It forbids lobsters from being transported on ice. It is not clear in my translation (“Direct contact with ice or iced water can cause cold in the animals damage arises.”) if this is because of concerns about “pain”. A paper I co-authored in 2015 that showed crayfish do not avoid very low temperature stimuli. The law seems to require that lobsters and crayfish are anaesthetised before being killed (Google translates the word as “stunned,” but this doesn’t seem to refer to electrical stunning). 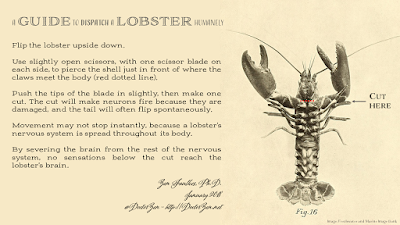 But when you ask crustacean biologists how to aneasthetize crustaceans, one common answer is, “Put them on ice.” Even the Q and A recommends cooling lobsters before killing them. It’s not clear why cooling is recommended but ice is illegal. (T)here’s no scientific evidence to support the position. The recommendations for killing lobsters in the RSPCA document are generally consistent with what I do when using decapod crustaceans for research. (Image also shows up here.) The image at the top of this post shows how I was taught to sacrifice decapod crustaceans in a humane way. It is not the only way, but I think it is reasonable and fairly easy. I agree with the goals of this law. You should be careful in handling and killing animals rather than careless. But it’s not a strong model for science informing policy. P.S.—One interesting tidbit I learned in perusing the Swiss documents is that Crustastun (which I wrote about eight years ago; see also here) makes no equipment, according to the Swiss Q and A document. Fish feel pain. Now what? Another country has banned boiling live lobsters. Some scientists wonder why.